Ellen Briggs is an author, comedy writer, and professional MC but where she is most at home is on the stage doing stand up comedy. Early on in her career, she was a finalist in the prestigious RAW Comedy Competition and won a National Foxtel competition that was voted on by peers and managers in the industry. She has never looked back. 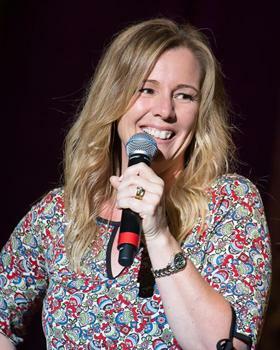 Ellen regularly performs as a comedian and MC at venues all over Australia, and has created a stand up comedy show called Women Like Us with fellow comedian Mandy Nolan that they tour all over Australia to packed houses and rave reviews. On the 1st May 2018 they released their co-authored book,” Women Like Us” which needed a reprint in the first week! In 2017 Ellen was selected by the Melbourne International Comedy Festival to perform at the Melbourne Town Hall in UpFront, the women’s comedy gala to over 2,000 people. In early 2018 she toured with Arj Barker and Gordon Southern with Punchline Comedy through Asia to rave reviews in all those shows. Ellen has an easy-going, friendly nature that belies the dark wit that lurks beneath. She is completely relatable and it comes naturally to her. It’s been said that "Ellen says out loud the things other mothers only dare to even think", and that Ellen takes her audience on an observational and hilarious journey through life as an accidental mother of identical twins and the wife of a husband who is away working for 8 months of the year. She has made an art-form of sneaking really politically incorrect jokes onto the end of "nice" yarns. She launches the punch lines stealthily. You won’t see them coming, but you’ll know when they hit. Ellen has performed alongside all of the big names in Australian comedy, and is highly regarded and a much loved collegue. Ellen is a favourite at ladies events, such as Melbourne Cup Lunches, Girls Nights In and numerous other Cancer Council and fundraising events. She has also become sought after for men’s luncheons and functions, for a hilarious women’s perspective that is not often heard at those events! Regionally based, she is as comfortable hosting national conferences such as the Agricultural Show Society and Poultry Associations as she is performing in premier comedy clubs such as The Comics Lounge in Melbourne and the Sit Down Comedy Club in Brisbane.